Class I: Rough stones containing only symbols, dating from the 6th to 8th c AD. 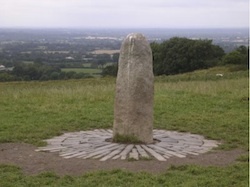 Class III: A controversial classification that “throws in” such free-standing markers as gravestones, crosses and boundary markers; none of the class III stones bear symbols. 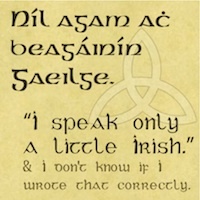 The first fact to note here is that the classifications all include post-Christian dates, i.e., from around 600 AD, a few generations after St. Patrick went to Ireland and sent his monks throughout Éire and Alba (modern Scotland). These designs do not take into account the figures of animals, fish, birds, “monsters,” and humans that found their way onto the stones and that are so widely copied today on our bodies and clothing too. I will show these figures in part II of this article next week. 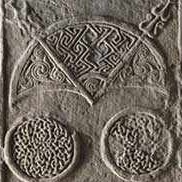 These symbols, it has been suggested, predate the symbol stones and were perhaps based on the tattoos the Pictish tribes used to decorate their bodies. From body adornments, which may have had symbolic or magical properties, the symbols may have been transferred onto objects such as jewellery, shields and doorposts before finally ending up on the symbol stones. Simple or early forms of the symbols are carved on the walls of coastal caves at East Wemyss, Fife and Covesea, Moray. 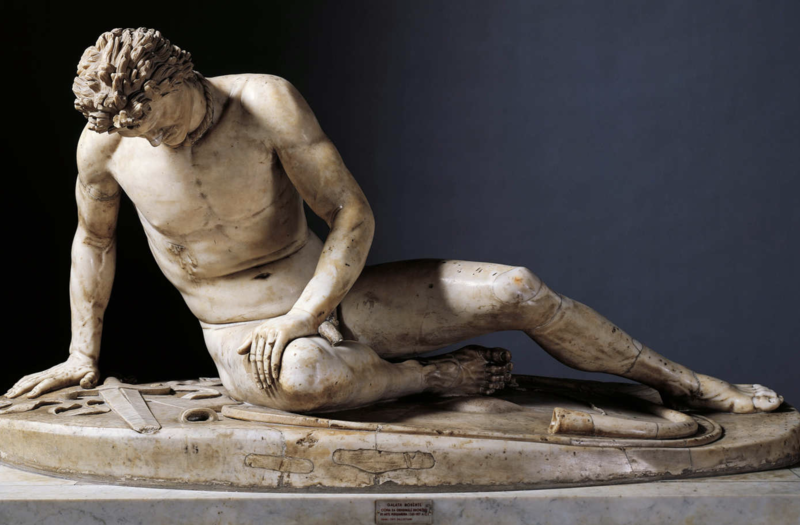 It is therefore thought likely that they were represented in other more perishable forms that have not survived in the archaeological record, perhaps including clothing and tattoos. I have absolutely no doubt that Pictish inscriptions were painted in caves, and that they will be found by archaeologists, along with creature symbols to rival those of the neanderthal-age cave paintings in France. 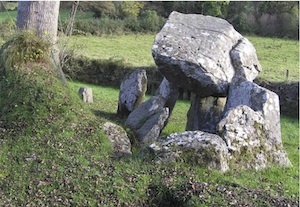 The stone pictured on the right is called the Dunnichen Stone, a Class I stone as you can see from the presence of symbols only, and the lack of any Christian cross design. 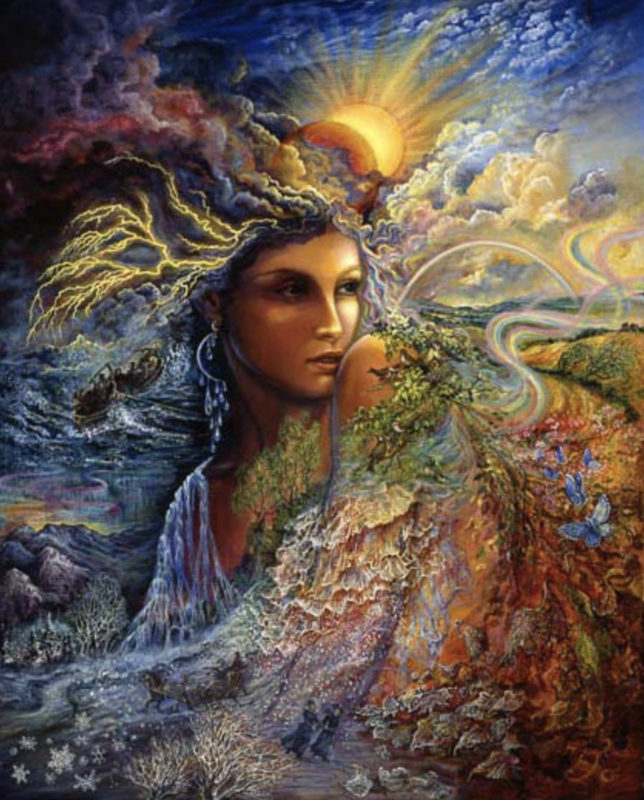 Some have said that the “comb and mirror” designations reflect the matrilineal society of the Picts and perhaps denote the property, grave or other territory of a locally powerful female figure. 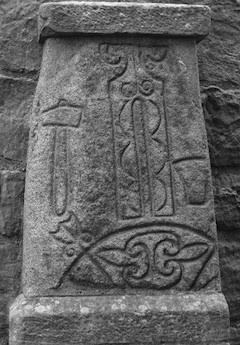 The top figure on the stone is thought to be a flower, a relatively rare symbol in Pictish stone work. The stone was found in a farmer’s field, plowed up to expose its sandstone face. 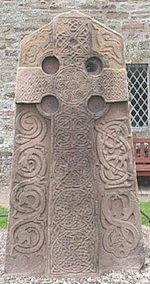 It has since been moved to nearby Dunnichen in Scotland. The stone measures a little over four and a half feet tall, two feet wide and one foot thick. My writer’s imagination immediately seized on this spectacular stone, and I have given it the name “The Queen’s Stone.” It has found a place in my writing, and a lovely woman has already been created (by artist/author Rebecca Poole) to befit the stone. I show the link after this article. 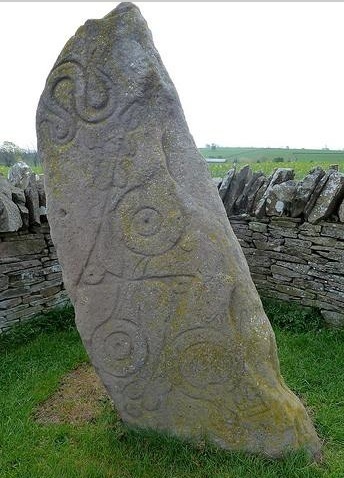 Here is another stone found near Aberlemno in Angus (roughly 20 miles NE of Dundee, Scotland) that is famously called the Serpent Stone. 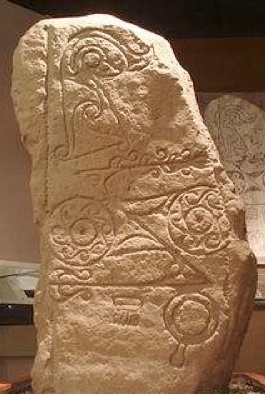 Archaeologists call it Aberlemno I, referring to its “class I status” as I describe above. As much as the first stone reminds me of a powerful woman, this one speaks of a strong male figure, perhaps a king. It is five feet tall, and the back of the stone is incised by “cup marks,” perhaps carved in a distant prehistoric time. 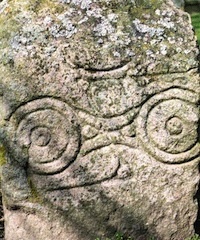 The “feminine” symbols of mirror and comb are located near the bottom, and the center, like the Dunnichen Stone, is dominated by the Z-rod and disk symbols. The dominant position of the serpent and the overall phallic shape are, to me, remarkably a male, just as as the flower and overall shape of the Dunnichen Stone conjure up a female image. This one is a roadside stone, marred somewhat by plow marks, located in a dry stone wall. 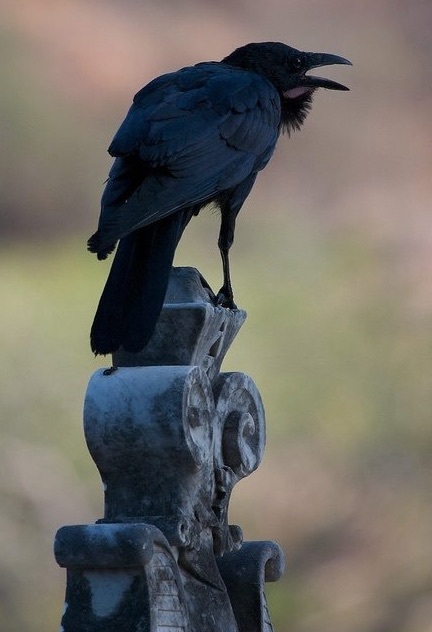 It is one of the few that have been left in their original location; most have been moved to churchyards and museums. My identification of “male” and “female” symbols and stones are strictly my own, based on a fertile imagination and a lifelong love of stones. 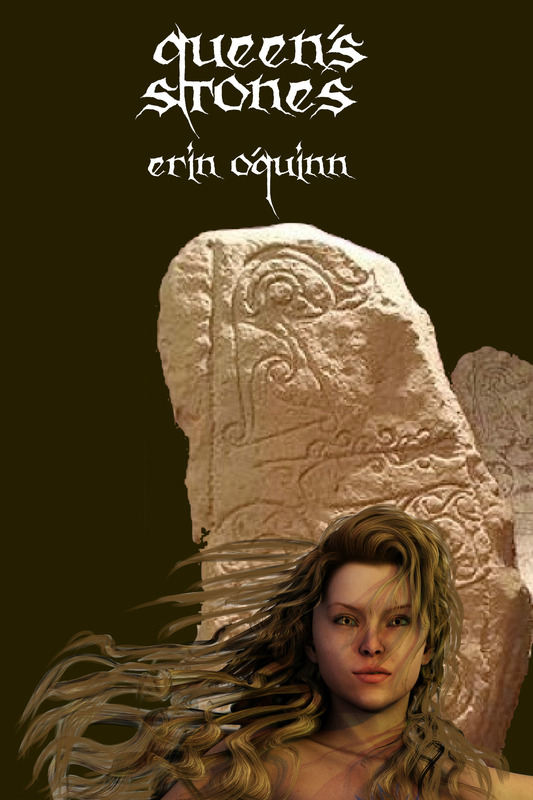 As promised, here’s an image and link to my short story inspired by (ta-DAH) that Dunnichen stone. How can a cheeky stranger know the ancient secret of the stones? And even if he could ever guess…how could he possibly discover her own? As they say, if you want it to last for ever write it on stone. The stones are the peoples legacy. 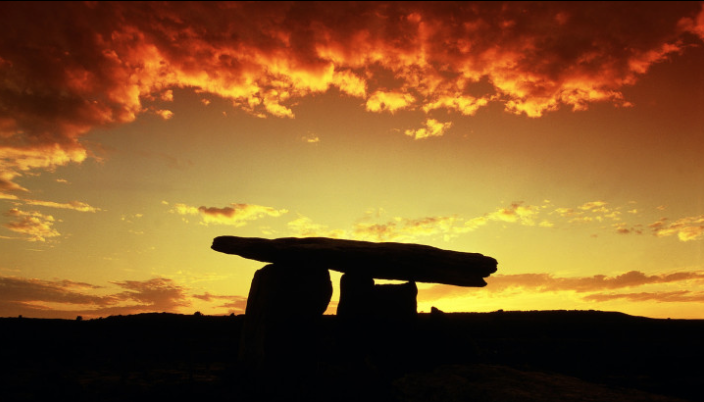 Long after the last trace of pedigree can be found in the bloodlines of the native inhabitants, these stone preserve a peoples culture that fortunately we now can appreciate. I look at these symbols and I am reminded of the Egyptian belief that once magickal symbols are etched in stone the become real and alive. What powerful magick this must be to have lasted throughout the ages! Great article Erin, I am sure your vivd imagination will do these stones and the culture it preserves justice. Jan, your words remind me of the Indian petroglyphs I used to see all over eastern Nevada where I grew up, and further south, near Buffalo Gap outside of Las Vegas. You’re right–those symbols will live forever, and many of them have been transcribed and understood hundreds of years later. Not as ancient as the Pitish carvings, but I’m sure the same passion inspired both–the urge to communicate with other human beings, of whatever faith, in whatever age. Very thoughtful comments, and thanks. Great article, Erin. 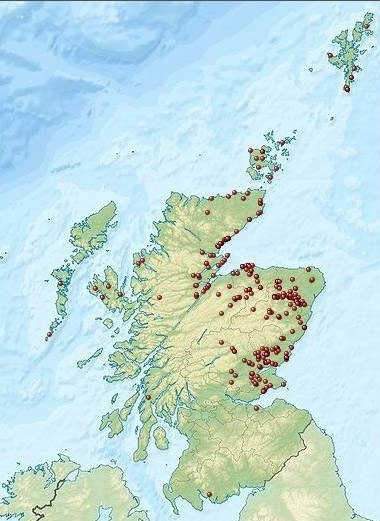 They are such fascinating objects and I’ve come across a fair number in Scotland – even in more western parts of Scotland they soemtimes turn up in old church graveyards or have been found and preserved. No wonder they spark your imagination. Thanks for stopping by, Rosemary. It’s fascinatng to me how many of those stones have been turned up by plows in a farmer’s feld, or have somehow been found even though only a small part of them sticks out of the ground after all these centuries. As a child, I used to go with my parents to presumed Indian battle sites in Nevada looking for arrowheads, and I still remember the excitement of finding even a piece of flint, imagining that it was once attached to an arrow shaft. And the pictographs–don’t get me started! I’ve loved rocks since I can remember. Which came first?? 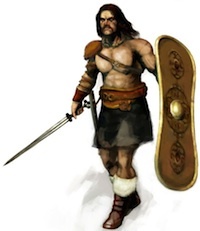 Well… most of my knowledge of the Picts comes from Robert E Howard (the Conan dude), so don’t ask me! Haha. Yes, most of people’s perceptions of those times and of those people came from that genius writer Robert E. Howard, a writer ahead of his time in many ways! 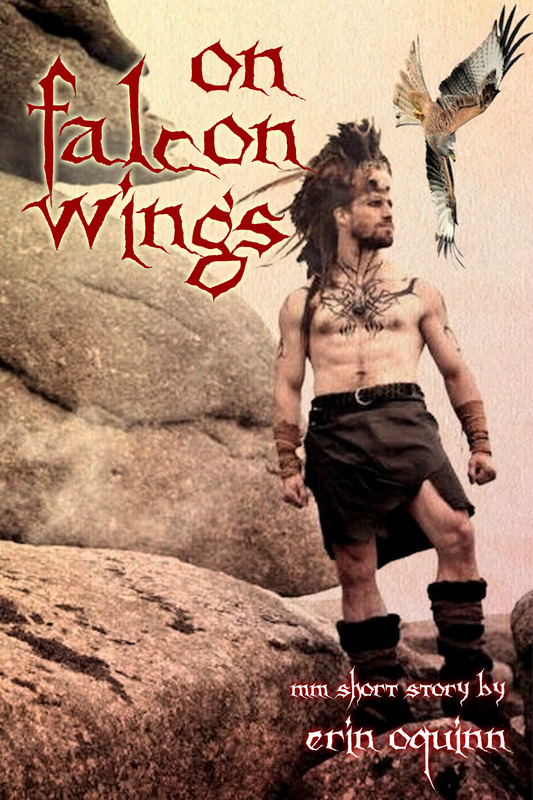 People always make the mistake with stones and artifacts without even considering oral tradition, it is best to go to Scotland, speak with the descendants of the culture, the rest is all limited to artifacts and conjecture, research is NOTHING without communicating with the genius loci, otherwise you have corrupt literature and artifacts without any true insight. Tyler, I agree! There is not one symbol the Picts used that was not based on their rich mythos, of which not a word was written in a language we understand… Meaning we must interpret symbols and explore cultural beliefs before we make assumptions.